I’m so busy this week so I wanted to share one of my all time favorite Budget Friendly Meals! I have literally been making this soup forever! 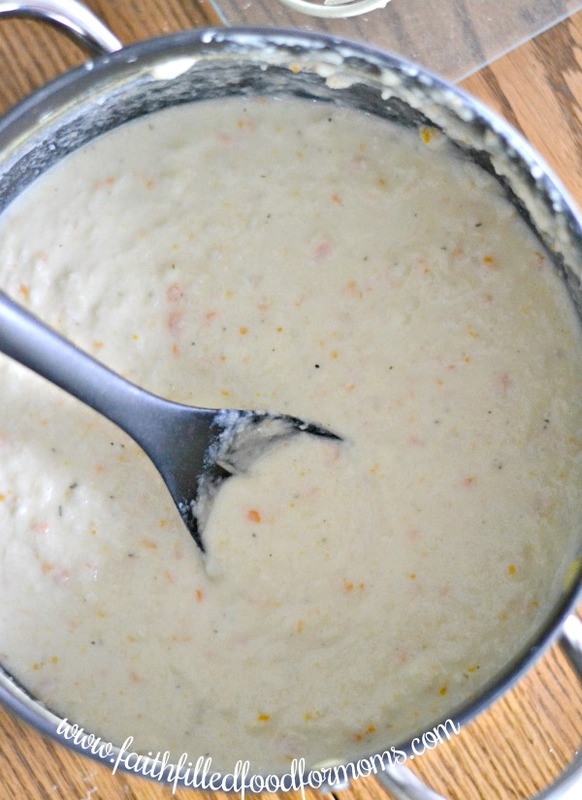 It’s The Easiest Creamy Potato Soup Recipe EVER! I first got this soup from a friend that brought it over to one of my home births. It was the most incredible meal after giving birth! My whole family LOVES this soup and they all ask me to bring it to family gatherings. 3 NOTE: In case you are wondering: You CAN substitute Milk for Cream in this soup. 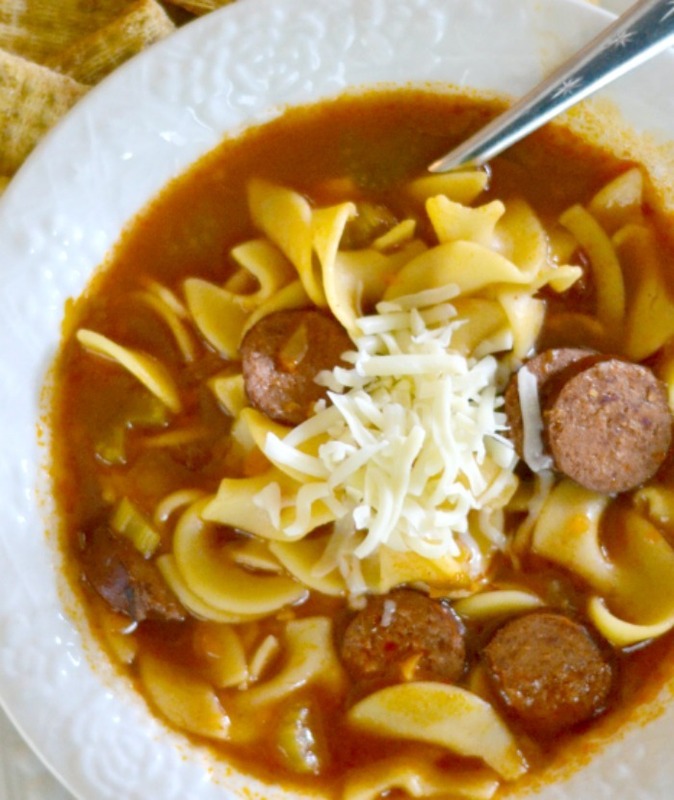 6 Need more soup recipes? NOTE: In case you are wondering: You CAN substitute Milk for Cream in this soup. Put in water and bouillon in large pot. add peeled and chopped potatoes. Add chopped carrots. Cook until tender – DON’T POUR OUT WATER. Mash with potato masher- add half and half, butter and parsley. Wondering what thickens potato soup? It’s the starch from the potatoes my friend, that’s why you don’t pour out the water after cooking. I use my little food processor to chop carrots, because it’s so fast! 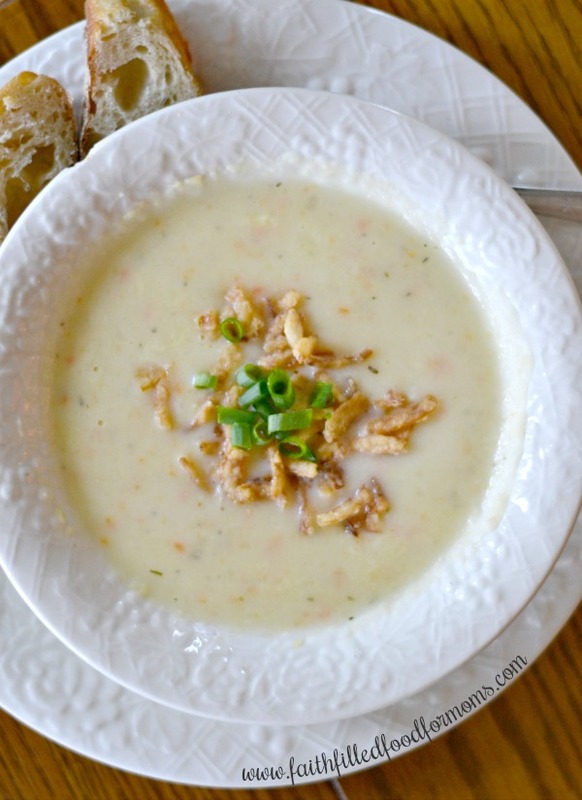 You can totally use bacon bits, green onions, cheese, croutons, crackers, breads, crispy onions as sides for this soup. You can freeze for later but the Potato Soup will be super thick so you’ll need to add more water so you get your desired consistency. A super yummy comfort food! This Creamy Potato Soup Recipe is quick and easy to put together. Great for having guests on a cold day! It's a family fave! Soup looks delicious…pinned it! Thanks! Thank you Debbie! It is Deelish! Have you tried freezing this? My mother-in-law would love this and I’m thinking of making batch for her to freeze. Hi Kelly! I think you could definately freeze this 🙂 Since milk products can be frozen and potato’s can be frozen. It might be a little less thick but still should be tasty 🙂 Let me know how she likes it! Thanks for stopping by! We <3 potato soup! I will have to try this recipe too! I am so going to make this! I love potato soup! That’s great Teresha! Hope you enjoy, it’s a fantastic comfort food:) Thanks for stopping by! your soup recipe is so easy to follow, thank you for sharing this. Hi Reyah! Thanks for stopping by! Yes it is such an easy recipe and Deelish 🙂 hope you will try it. Thanks for linking it up to MMMmondays at Acting Balanced! Thanks Heather for letting me link up! Look and sounds so good! I pinned this to share it with others.